Between 1890 and 1939, around 30,000 Javanese contract laborers were brought to Suriname. Alongside their own language, Javanese, they soon also started speaking the Surinamese lingua franca Sranantongo, and later on Dutch. Nowadays, their language has developed into a variety in its own right: Surinamese Javanese. It is spoken in a highly multilingual context. Surinamese Javanese speakers are usually also fluent in Dutch and Sranantongo. As a heritage language, it is expected to have undergone changes due to this intense language contact. Has Surinamese Javanese indeed diverged from Indonesian Javanese and to what extent? Words have changed, but is this also true for morphology, syntax and pragmatics? Which factors account for the changes encountered? The thesis comprises four case studies, which cover a wide range of linguistic domains: the expression of locative constructions, the use of multi-verb motion constructions, the expression of transfer events and the use and expression of voice. The results are analyzed both qualitatively and quantitatively, with the use of statistics where possible. 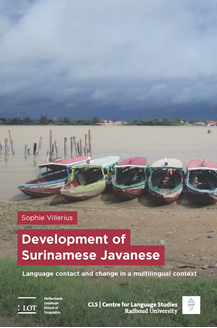 Apart from clearly being influenced by Dutch and Sranantongo in terms of borrowings and frequent code-switching, Surinamese Javanese is different from Indonesian Javanese in all four components analyzed in the case studies. In most cases, these divergences are manifested as changes in frequency: a formerly marginal pattern becomes more frequent. Other observed results of divergence are simplification, reanalysis and convergence to Sranantongo and Dutch. The results show that there is a relationship between fluency measures and signs of contact-induced change on the one hand, and measures of code-switching on the other, meaning that speakers who are less fluent and show more changes also code-switch more frequently. Differences between speakers are also reflected in the amount of contact-induced change they show.